21st Amendment's craft beer in a can, a take-home treat. In the truest sense, a pub is a community meeting place. “There’s an old saying in the industry that people come in for the beer, but they come back for the food,” says Shaun O’Sullivan, co-founder of San Francisco’s 21st Amendment Brewery. At their 2nd Street pub, they make sure that the grub matches the brew, which now comes in cans and isn’t about some kind of kitschy fad. According to O’Sullivan, it’s an environmentally sound idea, which can help ensure a better tasting beer. As for the cans themselves, “they are greener, they take less energy to make,” he says. 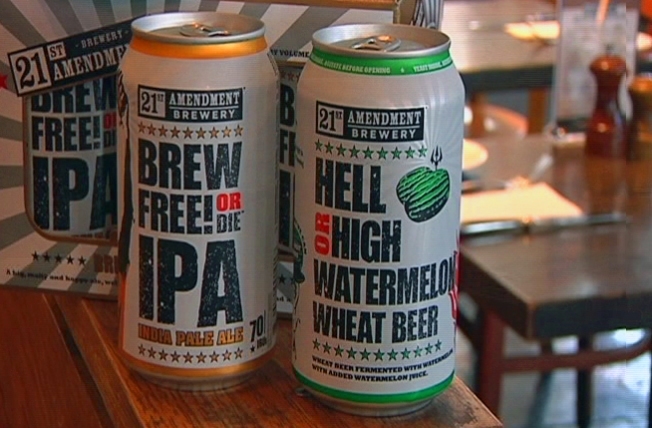 Craft beer in a can from the 21st Amendment isn't some kitschy fad. It's about taste and consideration for the environment. The 21st Amendment is also about its community. For instance, they essentially adopted a Noe Valley home brewing operation -- the Elizabeth Street Brewery. The two are now working together on a beer for this year’s Pro-Am competition at the Great American Beer Festival in Denver. “I brew 10 gallon batches at a time, all grain, in my back garden and basically, this recipe we’re going to brew together on their system is going to yield 390 gallons of beer,” says Elizabeth Street Brewery’s Richard Brewer-Hay. Laurence Scott puts both the Russian River Brewing Company’s ‘Pliny the Elder’ and Gordon Biersch's 'Dunkelweizen' at the top of his favorite Bay Area craft beer list, but 21st Amendment’s Watermelon Wheat is coming on strong.